Big Earl's "Designer Deuce" Is Leading The Rollerz Only Charge Down In Texas. Earl Dotson grew up around cars down in Beaumont, Texas, and started to collect Lowrider Magazines when he was a teenager. Earl got into the mini-truck movement back in the day, but for some reason he knew that a Chevy Impala convertible was what he really needed to cruise around Beaumont and then Corpus Christi, Texas, where he now lives. Earl had other things besides custom cars to keep him busy growing up. He attended Texas A&I University and played offensive tackle in the NFL for the Green Bay Packers, with whom he earned a Super Bowl ring. Most of Earl’s friends have been car nuts and he had his first real lowrider, a ’64 Chevy Impala, when he was 20. Following the ’64 was a ’96 Impala, a Chevy Suburban and then a ’61 Impala “bubbletop.” The ’61 was always on display in shows in Houston and San Antonio, Texas, winning numerous awards. He eventually traded in the ’61 for a ’62 Impala Super Sport convertible that he decided to take to another level. Earl’s “deuce” was influenced by the car that was used in the movie Boyz in the Hood. Earl wanted a clean car with West Coast style, but he knew that he needed to stay true to his roots as well so he added a little bit of “Dirty South” flavor to the ride. With that in mind, the first thing done to the car was the installation of a pop trunk kit. A custom-made actuator opens and closes the trunk at the touch of a button. The car was then gutted and the interior was reupholstered with Louis Vuitton leather that cost Earl a pretty penny. Actually, Earl had the car completed in just three months, since he already had everything planned out and the shops and individuals that had been lined up executed their work without any problems. For a nice custom touch, the side chrome pieces were painted black to match the body, then pinstriping was added along with Louis Vuitton logos. Now that’s retired from the NFL, Earl has the time to drive his Louis Vuitton ’62 around town. He told us that he had the car built to drive and not sit in a warehouse somewhere. Earl would like to thanks his friends, especially the guys at Southern Auto Sports in Corpus Christi, Raul, Terry and Daniel, his close friend “Jock,” Rex, Luis from Dallas, the “Candy Man” and his other family, Rollerz Only C.C., for helping him bring the car to life on the streets. Engine/Drivetrain: The 383-c.i.d. engine was set up to shine by Gilbert Rodriguez of Corpus Christi with tons of chrome accessories including the valve covers, water pump and alternator, along with a few chrome hard-lines. Body/Paint: The “deuce” was painted custom black by Leo at Southern Auto Sports in Corpus Christi. The firewall was shaved by Candy Man Kustoms. 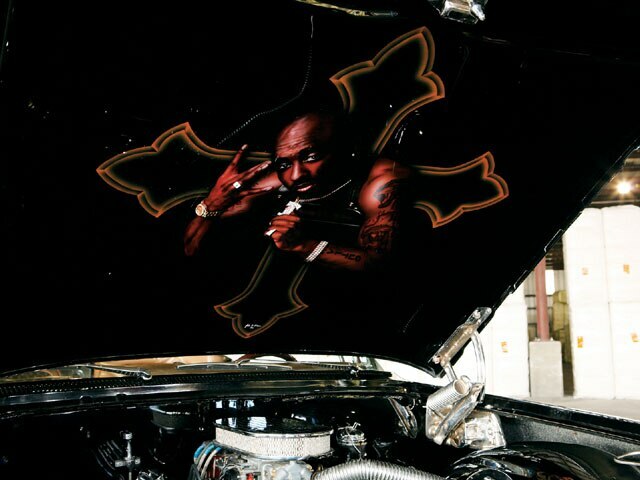 John Saenz did a few murals on the trunk about Earl’s life and a Tupac mural under the hood to show his love for the West Coast. 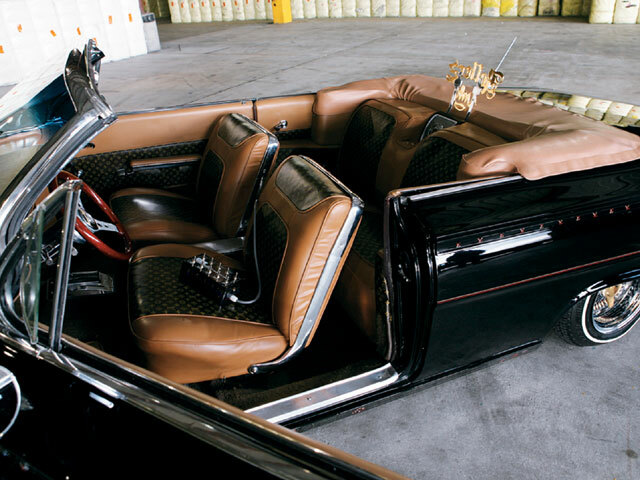 Interior: The interior was gutted and replaced with Louis Vuitton leather by John and Carlos at South Texas Customs in Corpus Christi. Sound System. 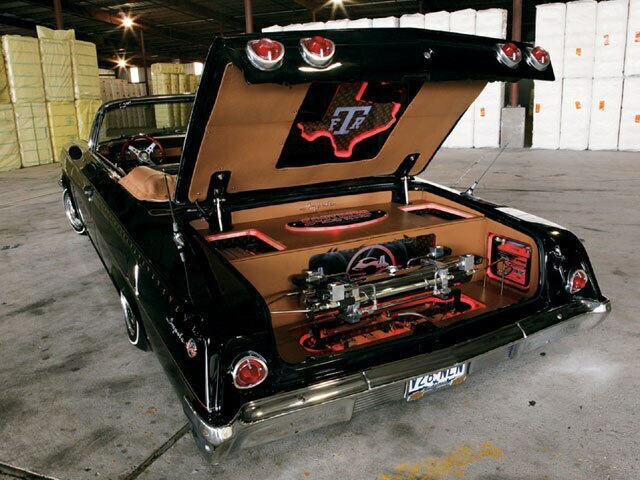 Earl had to show his “Dirty South” pride with a custom pop trunk that displays neon as well as Polk Audio and Momo components with two JL Audio woofers. The Impala plays “screwed and chopped” music through a Kenwood CD player. All of the extensive sound system work was done by Louis and Jacques at Southern Auto Sports. Setup: The hydros were done up by Daniel and Raul from Southern Auto Sports. The setup includes CCE pumps with Italian dumps, 6- and 12-inch cylinders, Delta batteries and 10 switches.